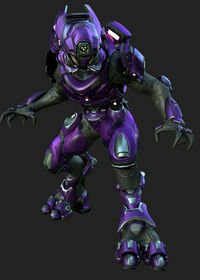 The Outrider harness is a set of Sangheili armor. The harness includes many sensor enhancements and exotic structural composites to boost survivability and effectiveness during high threat fighting and isolated surveillance missions on outlying frontier Sangheili colonies. Canon Fodder description: The Outrider combat harness includes a host of sensor enhancements and exotic structural composites which improve survivability and effectiveness during high-threat combat and isolated surveillance excursions on frontier worlds.